Find My Workspace lists over 95% of the serviced offices market in Bondi Junction. Simply click Request Quote to check pricing for one office, or Add to Basket for multiple offices. 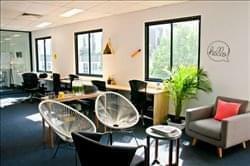 Experience the flexibility of a coworking space that has all the amenities and entertainment of the Junction on your doorstep, with the Sydney CBD just minutes away. The centre caters for hot desking, permanent desking, offices, meeting room and event space hire. Lockable office suites are available for teams of 1-10 with everything sorted for you from internet and furniture to cleaning and breakout areas. Or if being shut away isn’t for you, you can make the coworking space your home with a permanent desk on easy month –to-month memberships. A shared, naturally lit co-working area providing workers with pine desks and ergonomic chairs. Offering casual, part-time and full time access. With an adjacent to a 10 person boardroom space equipped with a TV and white board, each desk user can book up to one hour per day which are managed in an online calendar). Additional hours are available at an hourly rate of $25 per hour + GST for members however, can be booked by external community members or once off users at a rate of $40 per hour + GST. Workshop, group training, consulting and presentation space fit for groups from two people all the way up to 40 people are also available on site with prices that range from $25 per hour + GST to $60 per hour + GST. A shared, naturally lit co-working area catering up to eight people with pine desks and ergonomic chairs. Offering casual, part-time and full time access. With an adjacent to a 10 person boardroom space equipped with a TV and white board, each desk user can book up to one hour per day which are managed in an online calendar). Additional hours are available at an hourly rate of $25 per hour + GST for members however, can be booked by external community members or once off users at a rate of $40 per hour + GST. 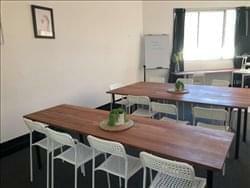 Workshop, group training, consulting and presentation space fit for groups from two people all the way up to 40 people are also available on site with prices that range from $25 per hour + GST to $60 per hour + GST. Situated in one of the upper levels of the tower, some of the offices and meeting rooms of this centre have stunning views of Sydney’s harbour, across the South Pacific Ocean and of the suburbs surrounding Bondi Junction. An office space offering spacious communal breakout areas equipped with a work-bar and kitchen as well as complimentary tea and coffee. Private suites, meeting rooms suitable for up to eight people, and co-working solutions that include day-by-day offices and flexi-desks are also on offer so you have a range of professional office types to choose from. Take advantage of the high-quality reception and administrative support, business grade internet, 24 hour access, and car and bike parking on-site to make your business life more manageable. To obtain information for your selected Bondi Junction Serviced Offices, please tick the "Add to basket" box for each office you prefer and complete the form below. We will then send a detailed report via email.